I'd like to return my focus on ikebana. I've had a long break from classes and have written about other things of interest to me and, I hope, to you. I made this arrangement during an International Class, the theme for which was Freestyle Arrangement. Unrestricted by any theme, I zeroed in on these gorgeous copper leaves and as I looked around for flowers these lime green viburnum practically leapt out of their bucket at me. So with materials in hand I looked for a suitable container and there it was in the back of the shelf quietly confident that I would pick it. I did, however, have a problem with the viburnum. You see they were long stems with a lot of foliage and really small flowers. Once I removed the foliage, the flowers were too few and too small to create the volume I needed to go with the leaves. So I bought another bunch of viburnum but they were still not enough. When Koka Fukushima sensei critiqued my work I mentioned my disappointment at the size of my flowers and she made a very good suggestion. She twisted together two or three of the flowers making one large flower head. This helped a little. Sensei's arrangement was in a large glass bowl and she used driftwood and only leaves in this dynamic composition. On the 25th and 26th April a significant event took place at Sogetsu Kaikan - the Iemoto Seminar. I'd first heard about it whilst still in Australia from my friend Emiko, who organized for a small group of us to attend together. We were Jennie and Stephen Stuart, Emiko and me. We attended the morning session of the 25th when three senior instructors demonstrated techniques for securing materials in different situations. It's too difficult for me to describe all the techniques but I tried to take notes and will be happy to share what I learnt with the ikebana community back home. Hakuho Kajitani created the following arrangements. Gaho Isono created the following arrangements. Seishu Okamoto created the following arrangements. AND THEN WE WENT TO LUNCH! Emiko, as the consummate hostess, had prearranged everything. 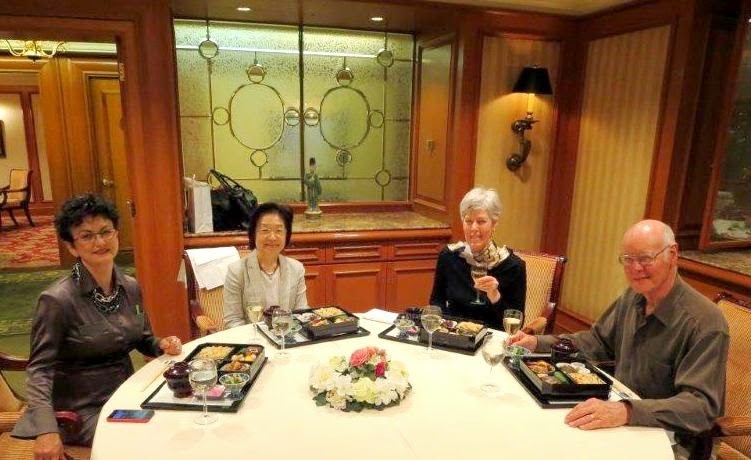 She had researched and booked a restaurant very close to Sogetsu Kaikan and organized the menu so that all we had to do was to arrive and enjoy a sumptuous Japanese lunch in pleasant company. Thank you, Emiko! I returned to the seminar in the afternoon without my companions as they had made other plans. There was a panel of three people on the stage, one of whom was Mr Kawana, having a discussion for a good part of the session. Unfortunately, it was all lost on me due to the language barrier but I was determined to wait for Mr Kawana's and Iemoto's demonstrations. And I was not disappointed. give an idea of the size of the installation. Mr Kawana and his assistants brought this structure onto the stage horizontally. Wires were then lowered from above, were attached to the structure and lifted it upright. It was made from distressed wood, driftwood and other dried materials. Then fresh material (I believe it was a form of azalea) was brought in and one by one, added to the structure. The end result was stunning! Then Iemoto orchestrated the construction of this amazing installation. The bamboo pieces were so long, they were difficult to control as they swung from side to side but, in the expert hands of the Atelier group and Iemoto's direction, the whole thing came together beautifully. The spring flowering material created a riot of colour. And finally, music together with a light show brought an other-worldly feel to the whole stage and transported us with it. Magic! I have been enjoying reading about your adventures and seeing all the wonderful pictures you have been posting. Thank you so much for sharing your trip to Japan with others.